There are a number of universal deep seated questions most people ponder at some point in their lives regarding forgiveness. Will my sins be forgiven, or are my transgressions so bad that they cannot ever be pardoned? How does forgiveness really work and is there anything that we can do to facilitate it? The Heavenly Doctrines have volumes to say about these issues and give us clear answers to these and many other questions related to forgiveness. We will explore these teachings and hopefully come away with a powerful sense of the Lord’s overwhelming wisdom, mercy, and compassion. It is only 194 kilometers from the Olivet New Church and just 154 kilometers from the Carmel New Church. It is also only 183 miles from Oak Arbor, Michigan so we are warmly welcoming any of our southern neighbors from the United States to attend as well! Every good church camp has the Lord at the center of it, and the opportunity to learn about Him from His Word and to worship Him with thankful praise! 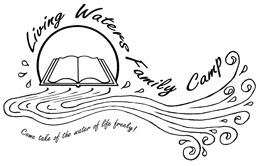 So at Living Waters Family Camp, in addition to the fun, we view worship and instruction as vital to the camp’s existence. Fun activities include canoeing on the scenic Saugeen River, fishing, hiking, bird watching, and swimming at the nearby beach on Lake Huron. There is a giant slip-n-slide, sand volleyball courts, trampolines, a ping pong table, a bonfire pit, canoes, kayaks, big fields for games, and a playground for the children. The other thing that makes a great church camp is the campers themselves, and that of course is you! So come with a great attitude, look for opportunities to be charitable to one another, make new friends, and deepen your friendships with old ones. I hope you will take time to pursue this opportunity and plan on attending this annual event! It runs Thursday through Sunday so you only have to take two precious vacation days to make it happen. There are scholarships available to ensure that the camp is affordable enough for everyone to attend! Grice Hall – Meeting place with a usable fireplace, ping pong table, chairs, couches, covered porch with picnic tables. Dining Hall – All meals provided, they even accommodate gluten free diets. There are of course, chairs and tables, but no high chairs. Seperate Men and Ladies Bathrooms.